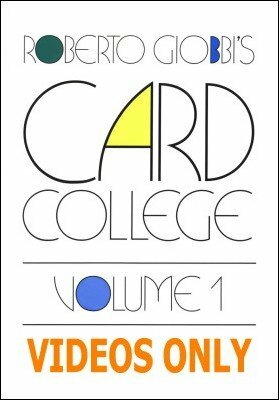 This is a companion DVD to the bestselling classic book "Card College 1" by Roberto Giobbi. The menu of this DVD mirrors exactly all 16 chapters of the book (English edition). For the companion DVD to volume 2 follow this link: Card College 2: Videos Only . Each technique is demonstrated with short video clips showing Roberto Giobbi performing. There are about 100 video clips on this DVD. Sometimes a technique is shown from different angles or in slow motion. So pop in this DVD into your player and enjoy to see how Roberto masterfully executes the techniques from Card College 1. Please know that the video clips only demonstrate the technique. There is no verbal explanation on the DVD since all of that and much more is already in the book. It is therefore a real companion DVD to the book. Although you can use it without the book the real value is unlocked by combining DVD and book.